What Are the Different User Roles and Types? The Team page includes all the members of your Payable account. 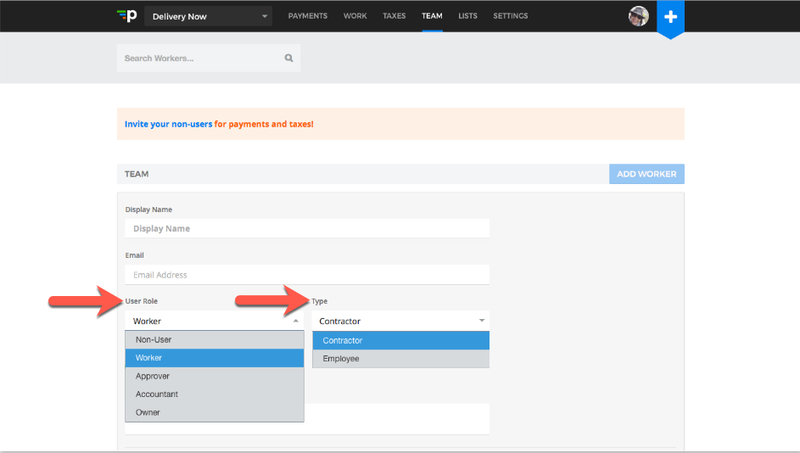 Payable allows you to add your company admins and independent workforce via this page. You'll be able to structure your Team by assigning the appropriate User Role and Type. In this article we will cover each of the User Roles and Types you can grant in Payable. The User Role defines the access level granted to your company account. For users you wish to remove from view. Revokes access to the platform. For your independent workforce that you actively send payments to and/or your recipients who may be owed a 1099 form. For admins with access to your company Payable account. Grants the ability to add workers and approvers, They can also approve work and initiate payments. You can restrict the ability to initiate payments via the Settings>Preferences page. For your accountant(s) with access to your company Payable account. Grants the ability to add workers, approvers and accountants. They can also approve work and initiate payments. You can restrict the ability to initiate payments via the Settings>Preferences page. For company owners and administrators. Grants the ability to add workers, approvers, accountants and owners. They can also approve work and initiate payments. The type defines how an assignee is paid (whether through Payable or otherwise). Defines information that is requested from the user (ie: bank info for contractors). For your independent workforce that will be paid via Payable. For the employees of your company that won't be paid via Payable as they are not independent contractors. How Do I Add New Contractors to Payable? How Do I Add My Accountant to Payable?